Reservations: A Touch of English B&B is open all year round including the Christmas Season. 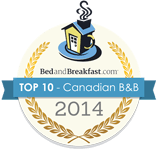 To check availability and make a reservation at our Kelowna Bed and Breakfast, click on the following link. A two night minimum is preferred, especially at weekends. Check-In: 4:00 – 6:30 PM (or by prior arrangement) Afternoon High Tea served upon arrival. Payment: Visa or MasterCard. All credit information is kept strictly confidential and confirmations will be emailed to the guest. In the event of a cancellation at any time – a $25.00 cancellation fee will apply. Cancellations made after 7 days – 1 night will be fully charged to the guest. Deposit: A one night deposit is required at the time of booking. Large in-ground swimming pool, children are accepted – 10 years and older. The pool will be open at 8:00 am and close at 10:00 pm daily.